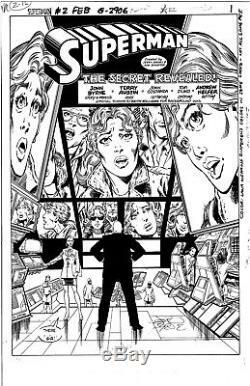 John Byrne Splash Page from Superman #2 Original Art from the Vol. 2 series published in 1987. It's on Full Size Comic Stock and the inks are intensely dark, like they were done yesterday! I'm offering this to finance a home improvement project, low ball offers won't be considered. If it doesn't sell, it goes back into the vault. If you're in the New England area please stop by to view in person, I'm in beautiful Warren, RI. We have over 100,000 books in inventory, send a message and we'll check. The item "Superman #2 Splash Page HTF Original Art John Byrne One Of A Kind" is in sale since Monday, November 5, 2018. This item is in the category "Collectibles\Comics\Original Comic Art\Other Original Comic Art". The seller is "eastbaycomix" and is located in Warren, Rhode Island.